The Quantum Sailing network is a great way for our crews to keep in touch with other people who enjoy sailing and to hear about all of our upcoming sailing opportunities and special offers. In response to suggestions from Network members we organise bespoke events and plan our Adventure Cruises to address to Network demand. It's absolutely free to join. 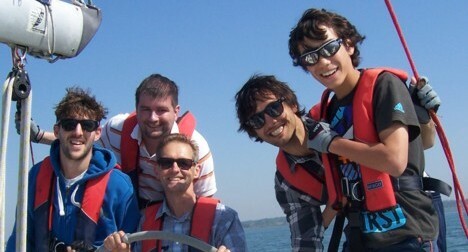 Just complete the signup form opposite or email us at info@quantumsailing.co.uk. You can unsubscribe at any time. You can also connect with us on Facebook and Twitter. Sailing experience: Novice Dinghy sailing RYA Comp Crew RYA Day Skipper RYA Coastal Yachtmaster RYA Offshore Yachtmaster RYA Ocean Yachtmaster Other (please say below).. The network is very active, with over 60% of members having sailed with us and almost half of those having done so multiple times already. To find out why our customers keep coming back, why not check out our testimonials page. Our latest quarterly newsletters can be viewed at Summer 2015. For previous versions, please see our downloads page.